Pipeline-as-code or defining the deployment pipeline through code rather than manual job creation through UI, provides tremendous benefits for teams automating builds and deployment infrastructure across their environments. Jenkins is a well-known open source continuous integration and continuous deployment automation tool. With the latest 2.0 release, Jenkins introduced the Pipeline plugin that implements Pipeline-as-code. This plugin lets you define delivery pipelines using concise scripts which deal elegantly with jobs involving persistence and asynchrony. The Pipeline-as-code’s script is also known as a Jenkinsfile. Jenkinsfiles uses a domain specific language syntax based on the Groovy programming language. They are persistent files which can be checked in and version-controlled along with the rest of their project source code. This file can contain the complete set of encoded steps (steps, nodes, and stages) necessary to define the entire application life-cycle, becoming the intersecting point between development and operations. One of the most common steps defined in a basic pipeline job is the Deploy step. The deployment stage encompasses everything from publishing build artifacts to pushing code into pre-production and production environments. This deployment stage usually involves both development and operations teams logging onto various remote nodes to run commands and/or scripts to deploy code and configuration. While there are a couple of existing ssh plugins for Jenkins, they currently don’t support the functionality such as logging into nodes for pipelines. Thus, there was a need for a plugin that supports these steps. 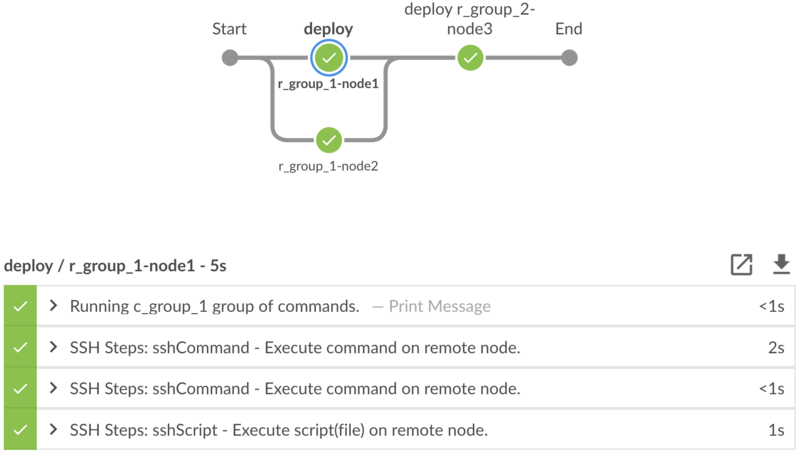 Recently, our team at Cerner started working on a project to automate deployments through Jenkins pipelines to help facilitate running commands on over one thousand nodes. We looked at several options including existing plugins, internal shared Jenkins libraries, and others. In the end, we felt it was best to create and open source a plugin to fill this gap so that it can be used across Cerner and beyond. sshCommand: Executes the given command on a remote node. sshScript: Executes the given shell script on a remote node. sshGet: Gets a file/directory from the remote node to current workspace. sshPut: Puts a file/directory from the current workspace to remote node. sshRemove: Removes a file/directory from the remote node. Below is a simple demonstration on how to use above steps. More documentation can be found on GitHub. The above example runs commands from c_group_1 on remote nodes within r_group_1 in parallel before it moves on to the next group using sshUserAcct (from the Jenkins Credentials store) to logon to nodes. We have created a shared pipeline library that contains a sshDeploy step to support the above mentioned YAML syntax. Below is the code snippet for the sshDeploy step from the library. The full version can be found here on Github. Steps from the SSH Steps Plugin are deliberately generic enough that they can be used for various other use-cases as well, not just for deploying code. Using SSH Steps has significantly reduced the time we spend on deployments and has given us the possibility of easily scaling our deployment workflows to various environments. Help us make this plugin better by contributing. Whether it is adding or suggesting a new feature, bug fixes, or simply improving documentation, contributions are always welcome. This entry was posted in pipeline, plugins, ssh, steps. Bookmark the permalink.